Buy yourself some piece of mind with travel insurance. Protection plans may be offered directly from the vendors we work with, but if your trip is composed of various components it may be easier to have everything covered under one policy from insurance companies such as Travel Guard. ​Just ask us for help and we can even provide a free quote! Don’t hold off until the last minute on purchasing a policy though, as you get additional benefits when purchased within 15 days of paying your deposit. ​Before heading out of the country you always want to make sure you can get into the country that you are visiting! You’ll probably tell your friends and family all about your upcoming trip, but don’t forget to alert your bank and/or credit card company. A transaction from abroad might seem like fraudulent activity so they may block it unless you have told them you will be out of the country. Check your bank for available foreign currency. They generally have better exchange rates than exchanging cash at the airport, and you never know when a business will be cash only! At home we use our phones for everything, but it can get expensive to keep them connected abroad. To help with that, some apps such as ​Google Maps and Google Translate have offline capabilities. Airlines and hotels also have their own apps that may be worth checking out. If you have a smartphone, be sure to check your phone's data plan before traveling abroad. Some companies offer temporary international data plans for purchase, but if you expect to use a lot of data while abroad, it may be worth it to buy a SIM card for your phone. Be sure to contact your provider before your departure for more details. Make your checked bag stand out. When you have dozens of suitcases coming out of one baggage carousel they all start to look the same. Make it easier on your eyes to find your suitcase by attaching a colorful handle wrap or luggage to it. Or, simply buy a suitcase with an extravagant design that others are unlikely to have. ​Don’t let your phone run out of battery and bring along a portable charger (also known as power banks or power packs). 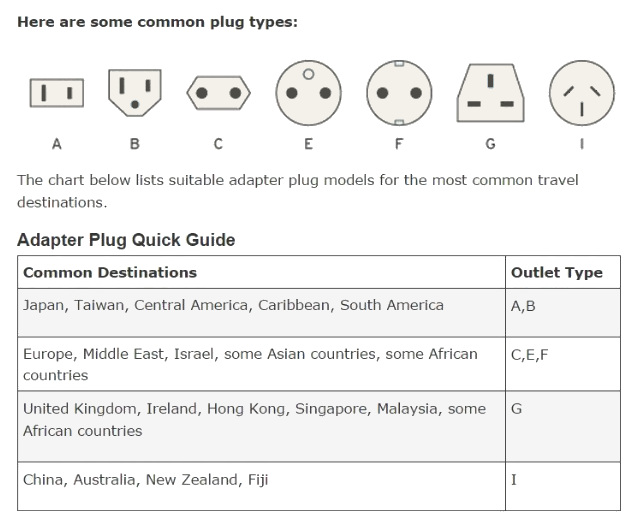 Make sure you have the proper outlet adapter for your destination. Type A and B below are the ones we use here in the US. ​Provide a copy of your plans to a trusted friend or family member in case of emergency. If a disaster happens in a city you are visiting, your friends and family may wonder if you are okay and will want to be in contact with you. If you have already moved on to the next part of your trip, then they will know that you are out of harm’s way by simply checking your itinerary. Be sure to also let them know how you can be reached (email, text, social media, etc.). & have a wonderful trip!